Our Drain Jetting engineer offers a professional service using impressive high power jetting equipment. 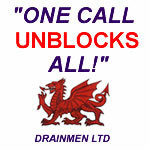 Cardiff Drainage - Drainmen LTD can carry out cleaning of sewers, grease traps, drains and interceptors. We can also carry out Tanker Jetting. If you have a blocked drain we can quickly get you back to normal with a minimum of fuss. Your reliable local Cardiff Drainage company, we provide an efficient, professional drainage service.